If you are planning to have some sort or addiction, make it into gardening. You'll reap the reward of being addicted. Seriously, gardening is one of my addictions. Working in my garden sooths my body and soul. It's like a great therapy for my being. Our yard is very small and my garden is like 400 sq feet in size which is not that big but somehow, we get so much produce every year. My father used to tell me that when you plant something in the ground, God will bless you and he was right. My father was always encouraging about gardening and cooking. Even my harvesting buddy would agree, right Dunkin? I bring our guinea pigs almost daily so he could eat some fresh grass. I always bring a box where he feels safer. He wouldn't run away if you have the box where he can sit. He love to knock this box and he would hide inside it especially when the dogs are out. I always keep the dogs inside when I bring him out just be on the safe side but sometimes, the kids forgot that I have Dunkin with me and they let the dogs out. That's when Dunkin freaks out. But anyway, back to the gardening I was talking about. This year, I only planted a pack of carrots so I planted the seeds far away from each other. Last year, I planted it so close so they were smaller than this year. Have you every smell a newly harvested carrots? It smells so divine! Even Dunkin smells it. He is thinking of nibbling on the carrots leaves. I harvested a bunch of kale and froze them for future use during winter time when I can't have fresh kale from the garden. I love carrot slaw more than coleslaw so I always make me a bowl every time. It taste so good especially that the carrot is fresh. I chopped the head of these carrots and put them back to the ground. Upon seeing these fresh veggies, hubby us hinting for Gumbo. It paid off to save the seeds of the tri-colored peppers I bought from the store because that's what I used to plant our peppers this year. This is the first year that I fully got to enjoy the peppers. The previous years, they were too late to bloom. That would be all for now. Till next time again. Feng Shui has been around for more than 5,000 years, ut many in the West have only discovered in the last two decades. Although there have been many jokes about the art of artfully rearranging your surroundings, few of us know what Feng Shui really is or whether it works at all. Here is a short primer on the philosophy behind Feng Shui and a few tips to incorporate it into your life. Contrary to poular belief, Feng Shui isn't magic, nor is it a decorating fad or a passing trend. Feng Shui is the science of changing the energy flows in your environment into order to facilitate positive energy and release negative emery. That may sound like hocus-pocus, so let's put it in simpler terms. It has been proven that a cluttered, dirty environment causes mental blocks and lack of energy. Many of us have experienced in our own lives the feeling of lightness and mental clarity that we feel when we finally clear that cluttered desk or straighten out our closets. Feng Shui uses the power of energy that is associated with the five elements of water, wood, metal, earth and fire - along with the placement of furnishings and accessories - to attract specific energies and improve the circulation of energy in our environment. In the same way that a blocked duct won't circulate air and cool or heat your home, the blockage of beneficial energy in a room will cause stagnation. While Feng Shui is no one-size solution for whatever ails you and it's best to have a personalized consultation, there are some things that can increase the energy flow for anyone. Get rid of clutter. Do you really need that stack of magazines and junk mail or that pile of clothes you never wear? Create a sense of balance. Symmetry is important for balance in your life. A pair of lamps or end tables not only create a symmetrical look, the refine a sense of balance in your life. Make small repairs. Broken or chipped bric-a-brac, torn window screens or broken door handles not only make your home look shabby, they reflect in how you feel about your life on a subconscious level. Add natural elements to your home. Feng Shui is about balance and energy flow, so having the right mix of each element will favorably influence the balance in your life. Add water elements to certain rooms with small fountains or a fish tank. Plants clean the air and bring the wood element into play. Candles and incense allude to fire, and rocks, sand and color balance out the rest. Balsam Hill Reviews is an example of a home decorating website that has accessories for many tastes and seasons of the year. Shopping online for home decorative items saves a lot of time, and it may help you to locate items that you can't find locally. Most trends today, whether it be homes, cars or other items, are following the ideas of more and more space. With space comes extra room to play, store and live in while helping to minimize the look of clutter. When there isn't a lot of opportunity to make a bigger area in your home, use these ideas to create the appearance of more space. When you have the opportunity, build with less walls or knock down walls in your home to create the openness that is desired. A technique used mainly in the communal areas, this allows the rooms to flow naturally into each other leaving the viewer with the feeling that the space is larger and easier to navigate. Simply section off areas in the oversized space to designate the traditional rooms for the functions that you desire. In times where you need to have interior doors , choose French doors to make the space feel like it extends past them. French doors are those with glass panels from the top to the bottom. While being able to see through the glass, it will allow for the same appearance of space as the open concept does but provides the option to shut the doors and curtains for privacy. They are particularly effective when leading outside as it gives the visual of the room extending outside into endless land. When space is a concern, eliminate unnecessary pieces of furniture that can be built into others or the walls. Find any area of dead space, such as under steps or behind doors, and build storage, shelves or any type of hidden treasure that you can think of to save space around the room. Dead cabinets under sinks can double as paper towel dispensers while a double shower rod can hold towels alongside the shower curtain. Any little bit of unused space can serve its purpose to create the much needed openness in the room. When faced with a smaller amount of space than you would like, use these tips to manage it properly and get as much usable area as you can to play with. These ideas create a better flow and use what you have in the best ways possible. The rest is up to you! I have different varieties of tomatoes in my gardden this year but the one that did realy well is the roma and cherry tomatoes. Roma tomatoes are great for coking but since I have tons, I decided to ca some of them. I also have Rusian and pear tomatoes which we have been juicing and making salsa since there's pleanty of them. My pepers also did great this year. One of our neighbors gave me thre selings of Thai peppers and there's a lot of fruits in it. My bell peppers are also doing great. I am jpust starting to harvest them. For some reason, they are the last ones to produce fruits. Thai opeoers are suoer hot. I love spicy fod so I love having these hotties. This pear tomatoes are great fir salsa or salad. They're a bit sweet and you can even eat them for snacks. Hubby and I were talking last night and remembered all the good times we've had in South Korea. I honestly miss the weekends there where we would go out and explore the city . Our favorite spots to go is the lake and by the oceam. They usually have musical shows on weekends. 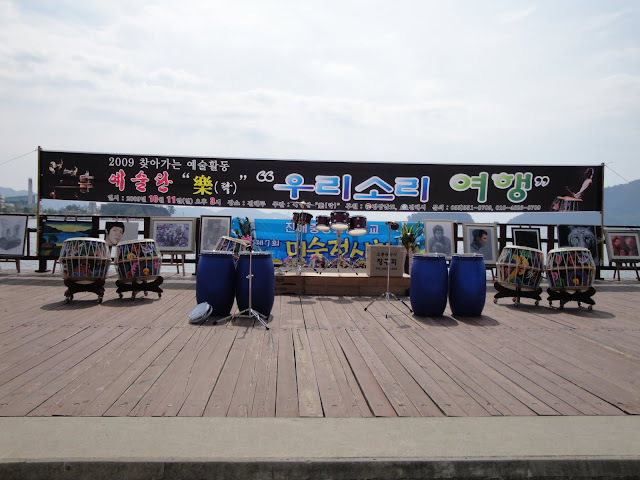 This was one of those weekends where they do traditional Korean music. I knw for sure that this is not drums for beginners but something that they been used for years and years.